One of our goals is to provide you with resources you can use for your business and in your life. Our collection of resources will be expanded as we continue to grow. We’ll also listen to you and if there’s something you want or need that we’re able to provide for you, we’ll post it here. There are coaches everywhere. Many don’t have the skills or training to provide coaching services. 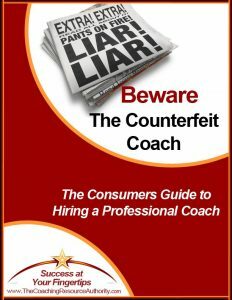 Before you hire a coach, read this guide. Click for more information about the Consumers Guide. Are you ready to read it now? Buy a Kindle copy for only $2.99. As Master Certified Coaches through the ICF, we are bound by the Code of Ethics promulgated by the organization. It defines the standards to which we are held as professional coaches. Read the complete Code of Ethics.